The current poll, conducted after the February parliamentary elections in Pakistan but prior to the resignation of former President Pervez Musharraf and the election of Pakistan Peoples Party (PPP) leader Asif Ali Zardari as the country’s new president, found that solid majorities held favorable views of both Zardari and Pakistan Muslim League (N) party leader Nawaz Sharif. Opinions of Musharraf were decidedly more negative, continuing a downward trend observed over the last few years in Pew surveys and other polls in Pakistan. Pakistani views toward the Taliban and al Qaeda are on balance negative, especially among better educated Pakistanis. However, about four-in-ten Pakistanis do not express an opinion about either group. The poll found that 64% held a favorable view of Zardari. And three-quarters expressed a positive view of Sharif. Positive views of Zardari and Sharif cut across gender, age and education categories. Views of Musharraf are, by contrast, largely negative. As of April this year, a majority (54%) of Pakistanis held unfavorable views of then President Pervez Musharraf. Pew polls have shown a decline in Musharraf’s image over time. 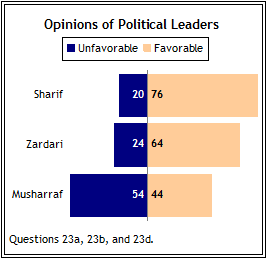 In 2004, 86% of Pakistanis had a favorable view of Musharraf. By May 2007, however, only 56% said he was having a positive influence in their country. Polls conducted by the International Republican Institute also show a decline in Musharraf’s job approval rating beginning in 2007 and continuing through 2008. On balance, more Pakistanis express a negative than a positive view of the Taliban and al Qaeda. One-third of Pakistanis hold an unfavorable view of the Taliban (33%) and al Qaeda (34%). Roughly one-quarter hold a favorable view of both groups while many Pakistanis do not express an opinion about either. Better educated Pakistanis – those with a high school education or more – are more likely to hold an unfavorable view of al Qaeda (41%) and the Taliban (40%) than those with less than a high school education (29% al Qaeda, 27% Taliban). Those under 50 years of age are also more likely to hold a negative view of the Taliban. More than one-third of Pakistanis age 18-29 (34%) and age 30-49 (36%) hold negative views of the Taliban while only 23% do among those age 50 or older. Slightly more than half of Pakistanis residing in the Sindh region express a negative view of al Qaeda (53%) and the Taliban (55%). Pakistanis living in the North-West Frontier Province, which borders Afghanistan, are most likely to not offer an opinion of al Qaeda (61%) or the Taliban (54%). Women are also particularly likely to offer no opinion about al Qaeda (55%) and the Taliban (55%). Positive views about al Qaeda’s leader Osama bin Laden are slightly more widespread than positive views about al Qaeda itself.5 About one-third (34%) of Pakistanis have confidence in bin Laden to do the right thing regarding world affairs (28% lack confidence). A plurality (38%) does not offer an opinion. Confidence in bin Laden has decreased in recent years, dropping from 51% in 2005, to 38% in 2006 and 2007, and 34% today.